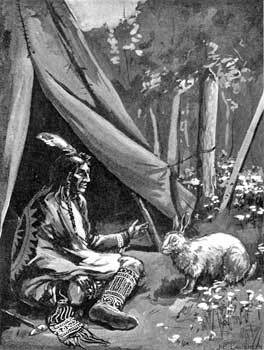 The rabbit tells Nanahboozhoo of his troubles. AUTHOR OF "BY CANOE AND DOG-TRAIN,"
"THE APOSTLE OF THE NORTH,"
"THREE BOYS IN THE WILD NORTH LAND," ETC. The oldest collection of folklore stories or myths now in existence is of East Indian origin and is preserved in the Sanskrit. The collection is called Hitopadesa, and the author was Veshnoo Sarma. Of this collection, Sir William Jones, the great Orientalist, wrote, "The fables of Veshnoo are the most beautiful, if not the most ancient, collection of apologues in the world." As far back as the sixth century translations were made from them. While the general impression is that the recital of these old myths and legends among Oriental nations was for the mere pastime of the crowds, it is well to bear in mind that many of them were used as a means to convey great truths or to reprove error. Hence the recital of them was not confined to a merely inquisitive audience that desired to be amused. We have a good example of this in the case of the recital by Jotham, as recorded in the book of Judges, of the legend of the gathering of the trees for the purpose of having one of them anointed king over the rest. Of this legend Dr. Adam Clarke, the commentator, says, "This is the oldest and, without exception, the best fable or apologue in the world."